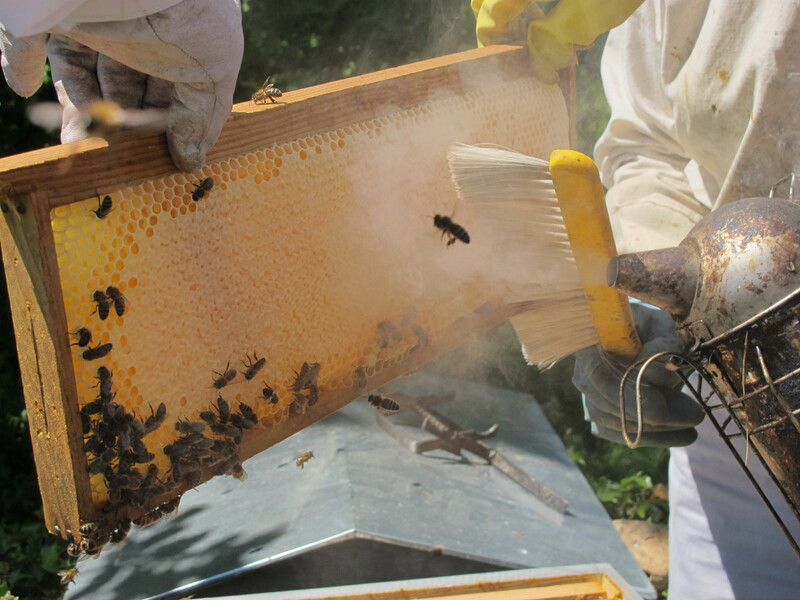 We were as busy as our bees have been–yesterday. Well Meredith and Alice were–my role was to snap the event as best I could, in the buzzing zone. I did get to wear the same protective clothing this time. It may look silly but it gets you to the coal face or rather the hive side. Alice had promised to bring the costume for me, so there was no escape. we all made our way to the hive at the end of the garden. 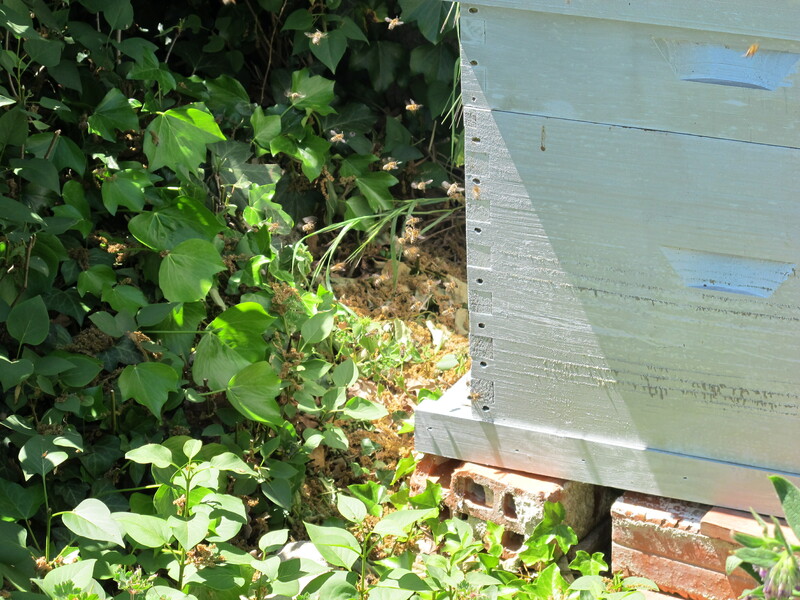 The bees were hard at it–an impressive sight–milling round the hive entrance, anxious to make their deliveries. The smoke gun was smoking and the two intrepids–brushes at the ready–were quickly at work. The third intrepid–camera at the ready–found being in the danger zone quite exhilarating, now that the astronaut-like look gave him license to roam! No need to swat or duck and dive this time, just smile benignly from the safe side of the veil. Click-click-click-buzz-buzz-buzzzzzzzz-swooosh-swooosh-swooosh (smoke gun noise)–a hive of activity in fact! 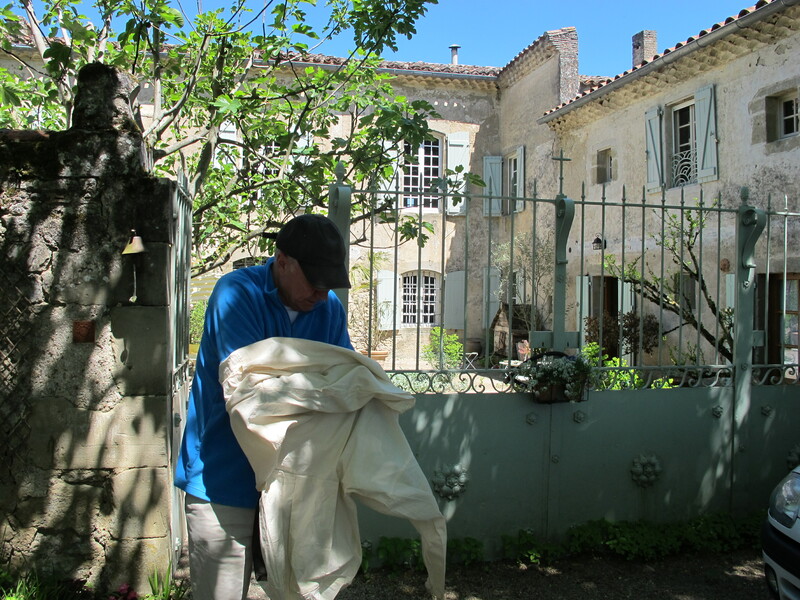 and after de-robing themselves, to Alice’s work place chez elle, to scrape off the honey and admire the recolte (harvest). 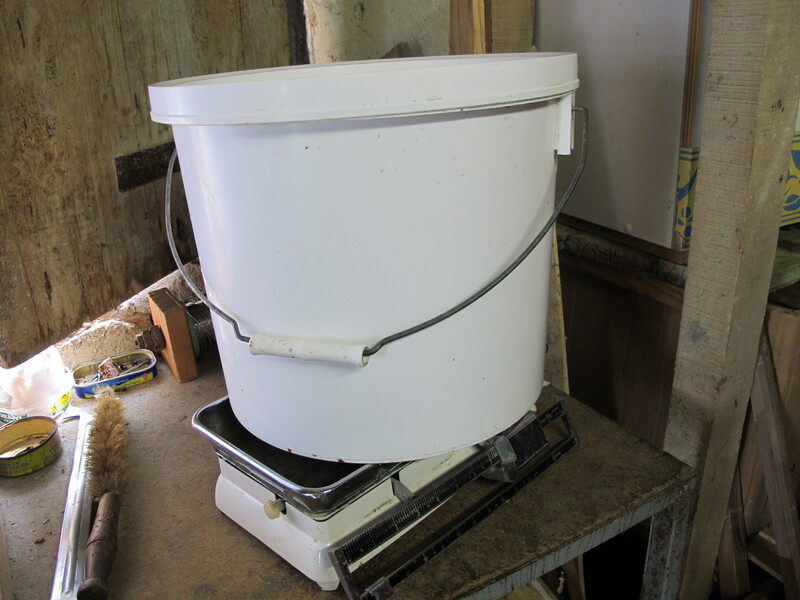 and carrying, with some effort, a large white tub containing seven and a half litres of honey! Convincing Peace sign for bees! Am I correct? Is that Peace sign or Victory sign? Well as long as it is not one finger. 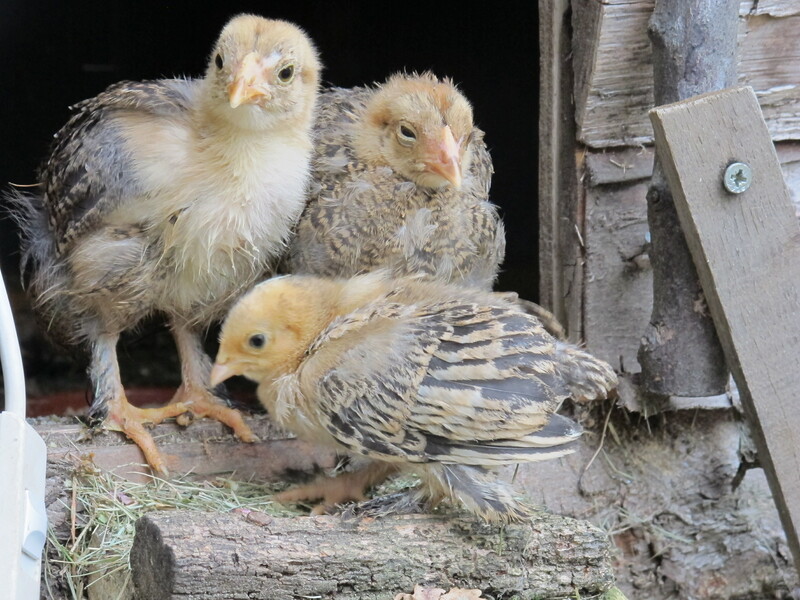 on May 17, 2012 at 8:51 pm | Reply Dianne P.
Now, are those little chickies pets…….? The three new chicks? Where is Beau? Wonderful! The title of today’s doings is almost as good as “Salmon Fishing in the Yemen”! Wonderful yield, too! Is it lavender honey? Must taste wonderful. 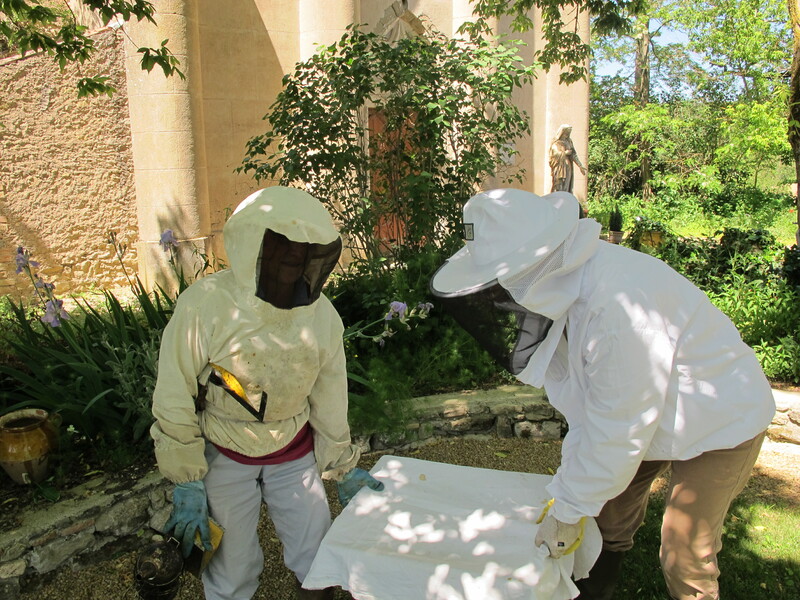 Bee-Keeping is now going urban, with hives on the roof of Buckingham Palace and Fortnum & Mason in London! Good thing, since bees are under threat at the moment and we need them all buzzing around! My mother used to keep a hive or two and we were told it was always important to tell the bees straight away if anyone had died! Probably country-lore, but fascinating to a child! Enjoy honey for tea, and for sore throats, etc., come winter! Good wishes from Bath and London! 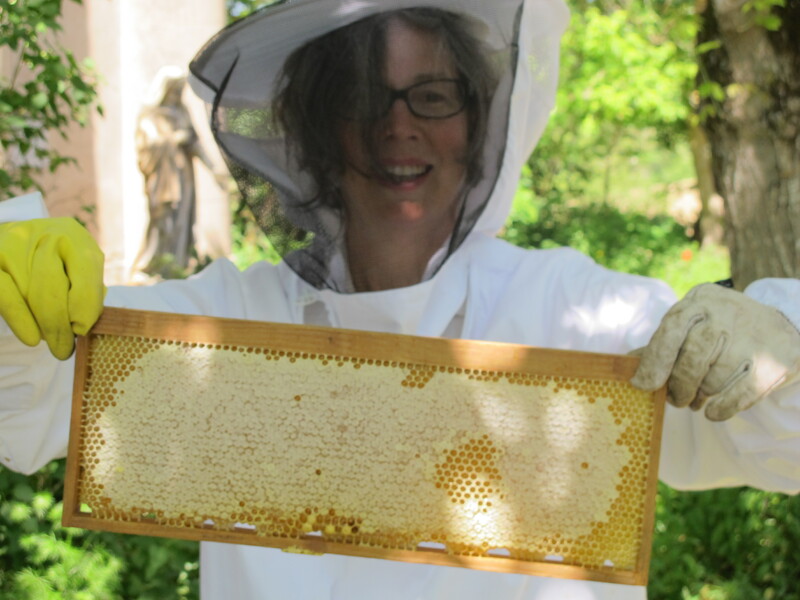 Thank you for this lovely post and the scenes of bee-keeping bliss. 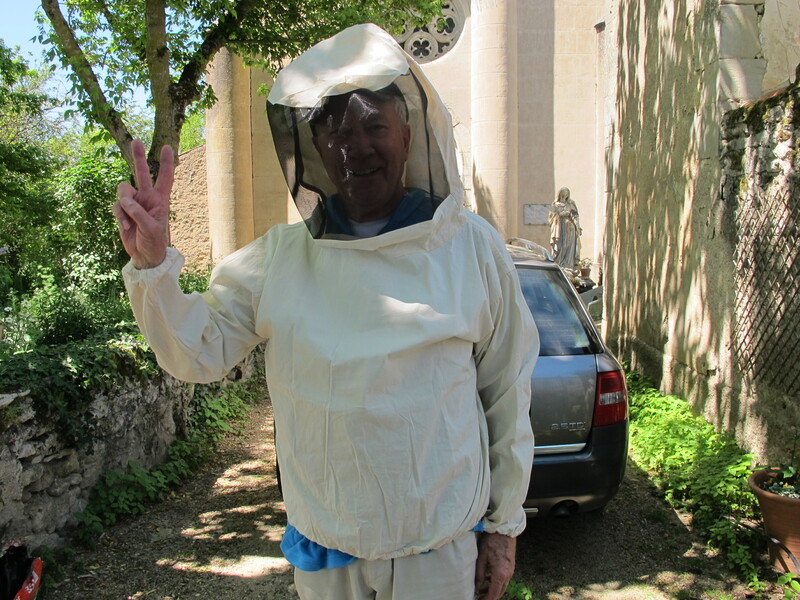 And Meredith must surely be the most glamourous bee-keeper ever! What a great photo.